144 Notes and 144 Notes Algorithm by Marko Kopač is licensed under a Creative Commons Attribution-NonCommercial-NoDerivatives 4.0 International License. Permissions beyond the scope of this license may be available at email. 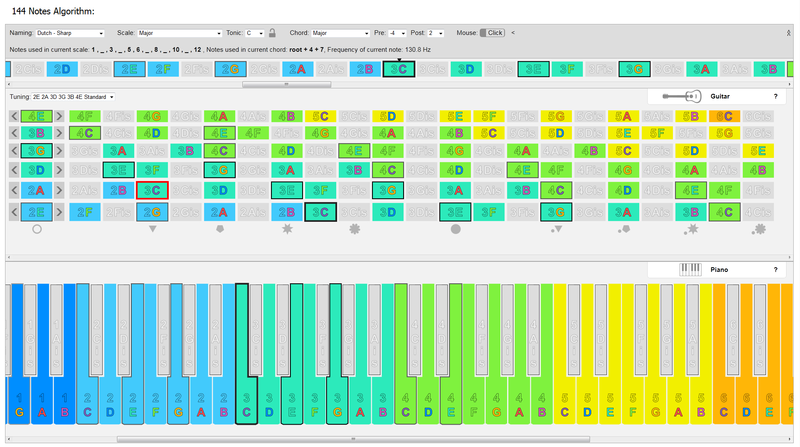 144 Notes Algorithm (144 Notes) is a visual representation of musical notes, where every note’s pitch is represented with 2 predefined colors. 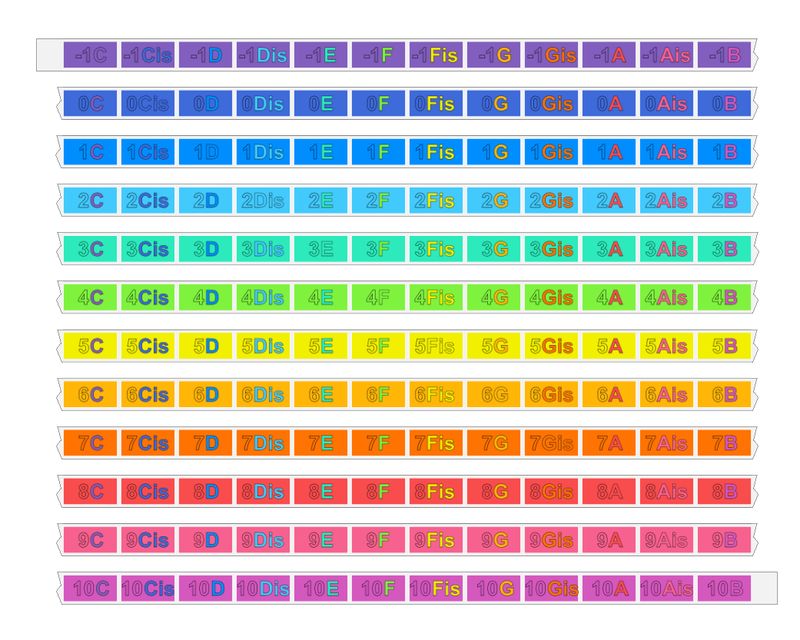 First color is the color of octave that the note belongs to and it is represented as background color. We could call it “the color of approximate pitch”. The second color represents the exact position of the note inside that octave. We could call it “the color of exact pitch”. To contain all notes in the range of human hearing I took span of 12 octaves and since every octave contains 12 notes we get 144 notes with 144 color combinations. Starting with dark hues for lower pitches and continuing to more warm hues for middle and higher pitches. C-1, C0, C1, C2, C3, C4, C5, C6, C7, C8, C9, C10. Cis-1, Cis0, Cis1, Cis2, Cis3, Cis4, Cis5, Cis6, Cis7, Cis8, Cis9, Cis10. B-1, B0, B1, B2, B3, B4, B5, B6, B7, B8, B9, B10. The color of octave number is also used for background of instruments. The two are separated with black or dark grey outline. This background fills the shape that gives certain tone on an instrument. 1. All (twelve) G notes – this is correct. 2. Specific G note – this is wrong and should be avoided, because octave is not defined. It is possible to apply 144 Notes (Algorithm) to most today’s musical instruments. Unofficial date of discovery is 14.7.2009. It’s possible to use the main idea in other fields of knowledge and science, on other things, and with more group nesting, but that does not concern this documentation.